On a windswept mountain in western Nevada, more than 8,000 feet above sea level, stands a forest of little trees — the bristlecone pines. They aren't much to look at — just eroded stumps with one or two clumps of green pine needles to show that there is still a spark of life in them. Compared to the giant redwoods, the great sequoias, the cedars of Lebanon and most other trees, the bristlecone pines are insignificant indeed. But these trees have one claim to fame. They are the oldest living things on earth. Incredible as it may seem, some of the trees in the bristlecone pine forest are more than 4,000 years old. No, that is not a misprint — four thousand years old. The oldest, known as Methuselah, may have started its life about 4,600 years ago. 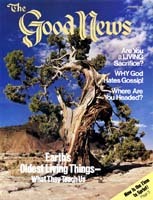 When Christ walked the earth, these trees had already lived two millennia. Even as Noah's ark was settling on the mountains of Ararat, the seeds of the bristlecones were perhaps beginning to sprout. And they have kept growing ever since. It hasn't been an easy life. These mountains are not the most hospitable place on earth. But, incredibly, the bristlecone pines have stayed alive. Not only alive, but actively, productively and usefully alive. And, in that, there is a lesson for every member of God's Church. A favorite hymn in the Worldwide Church of God hymnal is Psalm I: "Blessed and happy is the man..." The third verse, you remember, goes: "He shall be a tree that grows, planted by the river's side, which in season yields its fruit, green its leaves abide." The psalmist, David, saw an analogy between a "blessed and happy man" and a tree. To fully understand that analogy, you need to know something about trees, how they live and what they do. So please bear with me for a short botany lesson. Four main parts make up a tree: the roots, trunk, branches and leaves. The roots anchor the tree in the soil and gather essential minerals and water from the soil so the tree may make the food it needs to live. The trunk carries the moisture and minerals from the roots through the branches to the leaves and then carries food, in the form of sugars, back to the roots. The branches have just one purpose: to make sure the leaves can reach the light. They will twist and turn in all directions so that their leaves can see the sun. By a chemical reaction known as photosynthesis, the leaves transform the inorganic minerals from the soil into organic compounds that feed the tree. And, of course, trees produce, in season, the fruits and nuts by which they reproduce themselves. But a tree does not live just for itself. Every function of a tree's existence has a beneficial effect, not only to the tree, but on its entire environment. For instance, the roots not only anchor the tree in the ground, they anchor the soil itself, holding it in place against erosion. Then, of course, the trunk and branches provide timber for building, and firewood for fuel. We have already seen that a tree produces food through its leaves and fruit. In one sense, all physical life depends on this process, since animals and man cannot produce food from inorganic material as plants can. The leaves have another vital function. They manufacture oxygen, thus helping to keep the atmosphere breathable. Animals and man, as you know, breathe in oxygen and breathe out carbon dioxide. So, without trees and other green plants, the air we breathe would soon be stale and unable to support life. A tree does this as long as it lives. If it ever stops giving out, it dies. Still with me? Then perhaps you are beginning to see why a "blessed and happy man" (or woman) is like a tree planted by the river's side. Not only does such a person live a strong, healthy life, but he does not live it just for himself. Every aspect of his life is beneficial to others. His work, his play, his prayers and all his activities benefit other people. Like the tree, such a person does not just exist his life brings success, happiness and comfort to all those around him. He is indeed like a tree planted by a river, with an abundant supply of water and good, rich soil. He has resources and uses those resources. In season he "yields his fruit," and others benefit. "OK," some will say, "that's fine — a beautiful analogy for those who are called in the prime of life with a good education, a mate in the Church, healthy children, a good income and a nice home for entertaining. But many of us whom God has called are old, alone, poor, sick, lacking in education, crippled, in prison or living in poor countries and barely able to scratch out a living." Such brethren might feel they aren't exactly like "a tree planted by the river's side." They are more like a tree planted — well, on a barren mountaintop, for instance. Which brings us back to the bristlecone pine. These patriarchs of the plant world have had to fight to maintain their hold on life. Their roots have had to struggle for the sparse nutrients of the mountain soil. Their trunks and branches have had to withstand the ravages of thousands of winter storms and blizzards. They are torn, twisted and battered. Many of them have hardly any life left. You'd think they were dead, until you look closely. Then you'll find one branch with a few pine needles connected to the roots by a narrow strip of living tissue. But the point is that while the tree is alive, it does what a tree should do, and gives, what a tree should give. The few leaves that remain produce life-giving oxygen. The few seeds that are produced are of the same quality as those that come from trees thousands of years younger. Even though the tree may be old, living in harsh circumstances and crippled beyond recognition, it is not useless. It still produces good fruit. The quantity might not be the same as a tree "planted by the river's side," but the quality is the same. Here, then, is a lesson for the Christian who might feel he or she hasn't much to give. Such a person might be old and infirm, living in the most wretched poverty or confined by disease or illness to a wheelchair. This article is probably being read by brethren who are separated from other Church members by great distances — the only converted person in a nation of millions, perhaps. Or maybe widows without transport, resources or health. Or a member whom God has called while that person is serving a long prison sentence. Such members might sometimes feel useless. But there is no such thing as a useless member of the Body of Christ, any more than there is such a thing as a useless tree. A tree, however humble, can serve as long as it is alive. And a member of God's Church, in whom the Spirit of God resides, can always help the Work. Pastor General Herbert W. Armstrong once told a group of Ambassador College faculty members, "God does not call people as a favor, but because He has something for them to do." I wrote it down in my Bible because I wanted to remember it. I think you will, too. Your circumstances do not cut you off from being useful. Christ knows our circumstances and puts us to work in the Body of Christ as it pleases Him (I Cor. 12:18). Christ knows you whether you are a leading minister or a lonely widow, and He expects you to produce. "If the foot shall say, Because I am not the hand, I am not of the body... [or] if the ear shall say, Because I am not the eye, I am not of the body; is it therefore not of the body? … And the eye cannot say unto the hand, I have no need of thee: nor again the head to the feet, I have no need of you" (verses 15-16, 21). Can we say we don't need our members in such and such a place because they are poor? Can we do without the widows, the crippled or the members in prison? No! Verse 22 explains why. Those members are necessary. Although in this life those of you in those categories may be sorely tried, you are building valuable experience that one day will be needed in the Kingdom of God. Even now your prayers and hard-won tithes and offerings add something to the resources of the Kingdom of God that no one else could give. After all, it takes a widow to give a "widow's mite." God is interested in the quality of faith He sees (Matt. 17:20). So there is no such thing as a vestigial organ on the Body of Christ. All members are needed, and by working together effectively, they help the Work (Eph. 4:16). Take a look at the parable of the talents (Matt. 25:14-30). Christ recognizes that we have different circumstances and opportunities to serve. So, in the parable, the master gives his servants talents according to their abilities to use them. One gets five, another two and one gets but a single talent (verse 15). The servants who receive five and two talents respectively go to work and each increases 100 percent (verses 16-17). But the man with one talent doesn't produce. His attitude is "What good am I? I have hardly any talents." So he goes off and buries the little he has (verse 18). Then the lord returns. He rewards the two servants who, with their two different opportunities, produced. Since each has shown a 100 percent increase, he rewards them in the same way. Notice that the words of verse 21 and verse 23 are exactly the same. God looks on the heart, not the bank balance, race, nationality or job description. But what of the one who buried his talent? Read verses 24 to 30. He lost out. If the servant who had only one talent had done as the others did and produced something, the story would have been different. Let's learn from this. God made no mistake in calling you and begetting you as His child. You should add your strength to the Work of God. Don't feel badly about what you can't do — do what you can do. You might be surprised at how much that is. Anyone of God's ministers could tell you stories of people who have risen above their apparent limitations. Like widows who have prayer lists half a block long, or paraplegics who give stirring attack speeches in Spokesman Club. Here's one from my experience: A little, hunchbacked lady who could walk only with the aid of two canes counseled with me for baptism some years ago. "When I am in God's Church," she asked, "should I give up my involvement with the 'Meals on Wheels' service for the elderly?" "Not necessarily, ma'am," I told her. "Just be sure they don't bring you any unclean food." "Bring me? What do you mean, bring me?" she replied. "I mean, should I give up going to the kitchen to help prepare the meals and taking them to the old folks who need them? What do you think I am, handicapped or something?" Don't ever think you are useless. Each of us can give God and His Work 100 percent quality service, in our example and our prayers. If you are a tree planted by the river's side, thank God for it and work all the harder. But if not, still do your part. When a tree stops giving, it dies. But a tree can live for 4,000 years, high on a mountain, away from all other trees, and still make a contribution. A quality contribution — that's what counts. That is the lesson of the bristlecone pines.